Stickers of all shapes and sizes can be seen plastered over the laptops of college students typing away in the nooks of libraries and corners of coffee shops. These stickers can reveal a great deal about the owner and give strangers a glimpse into what the person is like, what music they listen to, where they’ve visited and their current obsessions. 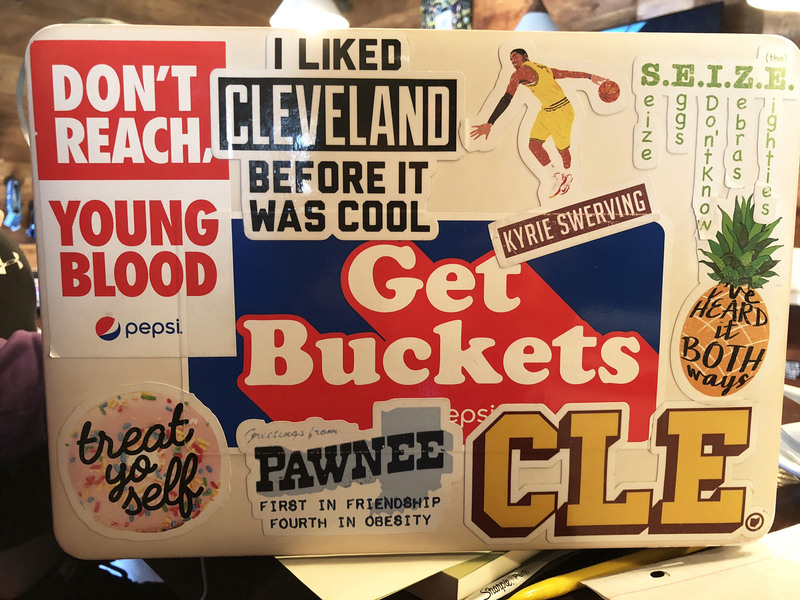 Customers at Stone Fruit Coffee Company on Youngstown State University’s campus were asked to reveal what their laptop stickers said about them. Morgan McGowan, a communication media major, said the majority of her stickers involve the music she listens to such as DNCE, Weezer, Panic! At The Disco and Twenty One Pilots. Chelsey Black, an exercise science major, said her laptop stickers show activities that she has participated in. Most students said they bought their stickers from redbubble.com or received them from bands or stores. Black, however, said she obtained her two large white llama stickers online, where they sent them to her for free. Madison Meeker, a business major, said she tries to find stickers that are black and white to fit the overall theme of her laptop. A majority of her stickers involve coffee and tattoo shop logos. Sometimes, these stickers can even have a special story and memory behind them. “One of [the stickers] my boyfriend gave me came from a tattoo shop in Pittsburgh,” Meeker said. Cami Becker, a biology major, showed her laptop stickers were mostly “science and art oriented.” She said most of the stickers she had were presents from her cousin. Some of her stickers included one that said “Save The Bees,” and another that said “Steminist.” Frida Kahlo and a small sticker of Vincent van Gogh’s “Starry Night” were also plastered to the back of her laptop. Addie Becker, a literature major who was visiting her cousin Cami at the time, had the most covered laptop in Stone Fruit. “I think my laptop stickers represent me as a whole,” she said. 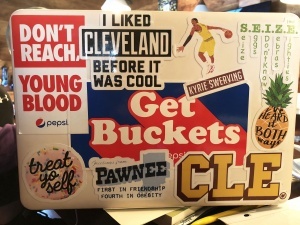 Her laptop had multiple stickers that revolved around Cleveland, Ohio and the Cleveland Cavaliers, as well as references to the TV comedy show “Parks and Recreation.” She also said she received her “Get Buckets” sticker from a Cavs game. Laptop stickers are an interesting way to tell the world a little more about yourself. Whether they reveal a passion for coffee, obsession with a band or an infatuation with space, stickers are a fun and intriguing way to start a conversation with a stranger with common interests and help people identify who they are.